Dr. Joyce Rosalind Aryee, the Founder of Salt & Light Ministries, has urged postgraduate students of the Ghana Institute of Journalism (GIJ) to be agents of great change in their respective fields, in order to spur national development. Delivering the keynote address at the third congregation of the School of Graduate Studies and Research (SoGSaR) of the GIJ, on Friday, on the theme: “Communication as a Catalyst for National Development”, Dr. Aryee said, in order to be great catalysts for development, it was important for communications professionals to be unifiers and not dissent causers. “…To be great catalysts, you graduating students ought to remember that you are supposed to be unifiers; you're to be unifiers rather than people who cause dissent and chaos,” she said. She stressed the need for communicators to strive to understand people in order to help in development, adding that, communication for development from sociological point of view, involved understanding people, their beliefs and values as well as their social and cultural norms. She said, it was only in knowing better, who people were, what they stood for, that they could create the harmony that will lead to a society strengthened by its difference and not destroyed by them. “My opinion is that communication processes can be used to enhance people's capacities for understanding, negotiating and making appropriate decisions and also capable of empowering individuals and communities to take actions to improve their lives,” she said. 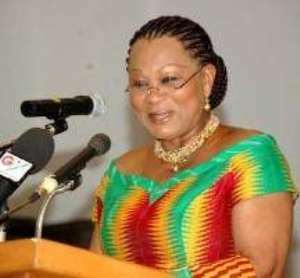 She said GIJ had made Ghana proud by producing a considerable number of communication experts, who have put their expertise at the service of the nation to aid the country’s development. 'The effort being made by GIJ in this regard re-echoes Dr. Kwame Nkrumah's strong and fervent beliefs in the power of communication to bring about development', Dr. Aryee noted, adding that, the nation's efforts towards development through communication were tied to investments in human capital through education and training of individuals. She emphasized that, in order for Ghana to achieve further development through communication, there was the need for quality communication experts, who could properly communicate policies, decisions and plans that were consistent with international communication trends. 'We need to sharpen our knowledge and skills on regular basis to ensure that our country does not lack the needed manpower to enhance communication meant for our development', she said. Professor Kwesi Anso Kyereme, the Chairman of GIJ's Governing Council, in his opening remarks, encouraged the graduates to let their professional communication skills be their guide. He said, success in development was contingent on how intended beneficiaries perceived themselves, adding that, if there was no communication there was not going to be any development. 'I will encourage you to choose the self-employment option, use your own imagination, cultivated from your critical examination of ideas and sense of communication that you have studied here; that catalyses national development' ', he said. Professor Kyereme urged the graduating students to sharpen their skills on regular basis by reading extensively. The graduation ceremony conferred Masters of Arts degrees on 178 students, who were taken through 15 months postgraduate education in four communication specialties. Sixteen students graduated in Journalism, 70 in Public Relations, 66 in Development -Communication and 26 in Media Management.